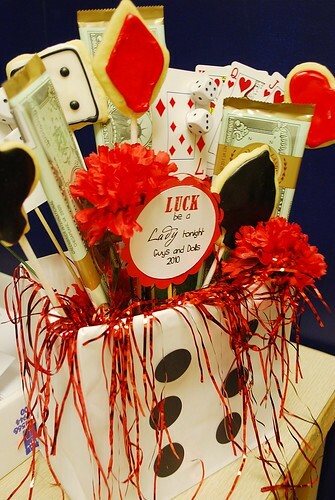 A Cookie Bouquet is the perfect graduation gift , birthday gift or for any special ocassion. 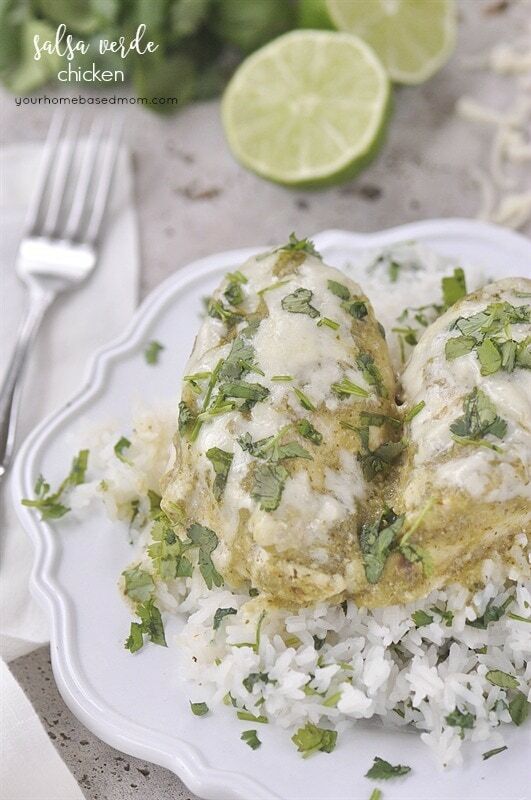 You can make them at home for a lot less money. A Cookie Bouquet is easier to make at home than you might think. It’s the perfect personalized gift idea. Note: I have updated my earlier sugar cookie cut out post with a second frosting recipe. There is a glaze recipe for when I want the cookies to have a dry, glossy finish and although the glaze tastes good I prefer my traditional butter frosting recipe when they are strictly for eating and not so much for looks or when they don’t need to be wrapped up and you are worried about the frosting getting smooshed. I am sure you have seen those cute cookie bouquets you can custom order–ever wonder how to make your own cookie bouquet? They are cute but cost a lot of money and the cookies really don’t taste all that great. Several years ago, a friend of mine had one delivered to her daughter after one of the performances of the high school musical. I thought it was a great idea. It was a nice alternative to a flower bouquet. I decided I could make my own. So last year, during Guys and Dolls I decided to try my hand at it and I must say, it turned out pretty good. I did it again this year for Hairspray. The first step is to decide what shape cookies you are going to make. 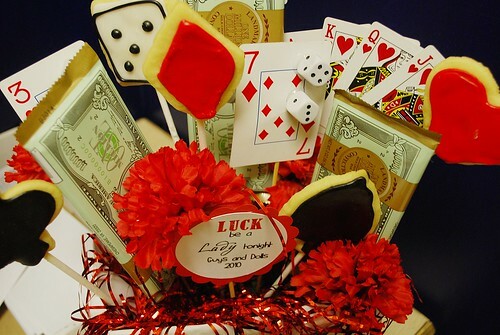 Using the storyline of the show, for Guys and Dolls I made cookies shaped like dice and the different suits of playing cards – hearts, spades, diamonds and what’s the other one? Clovers?? For the Hairspray themed bouquet I used crowns and flowers. I used my basic sugar cookie cut outs recipe. Remember how I suggested you pick up four paint sticks at the paint store?? Well, this is why. 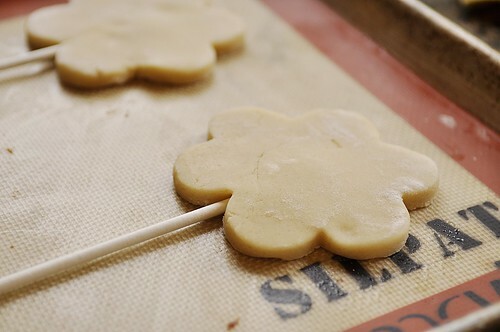 Because you will be putting a stick into the cookies for the bouquet they need to be thicker than the average sugar cookie. 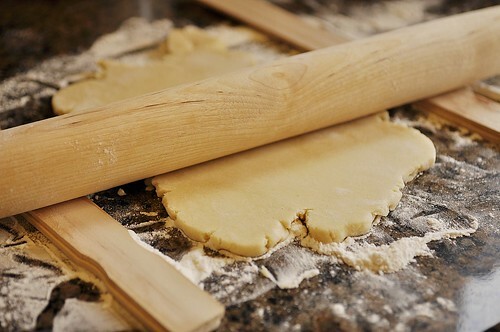 You will get the perfect thickness if you stack up two paint sticks on both sides of your dough and then place the rolling pin on top of the sticks to roll out the dough! 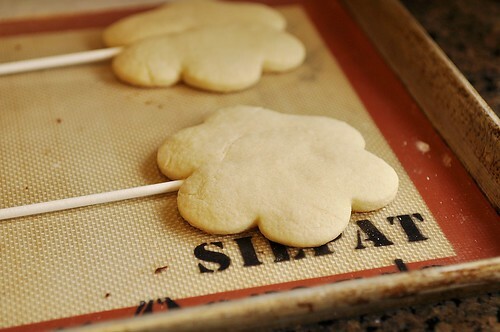 After your shapes are cut out insert a stick into the cookie. I used long sucker sticks from the cake decorating store but a wooden skewer will work too (the thicker ones are better). If the stick comes through a bit on the back side just patch it up with a little extra dough. Just dampen the area and it will stick. You don’t want the stick to show through. 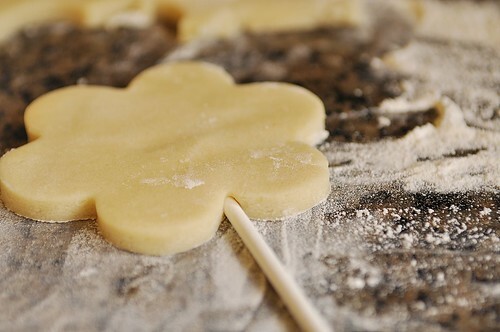 Just place the cookies, stick and all, on the cookie sheet and back. Let them cook completely before decorating. 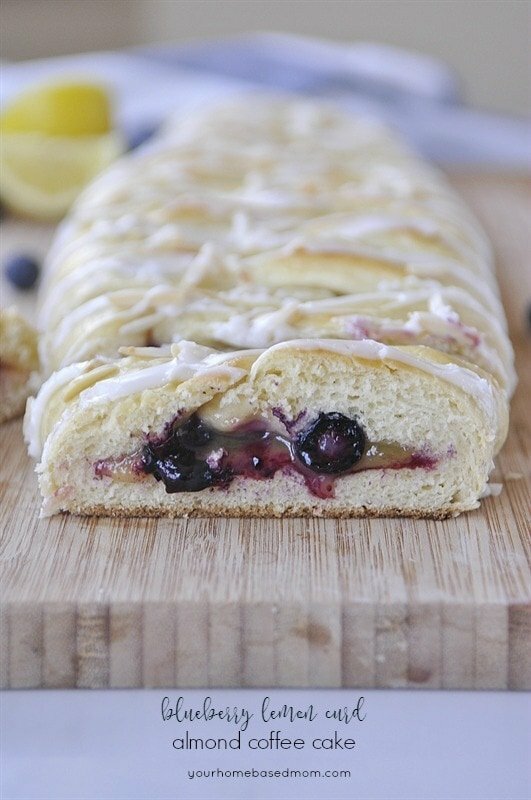 Use my sugar cookie glaze recipe to frost them with. 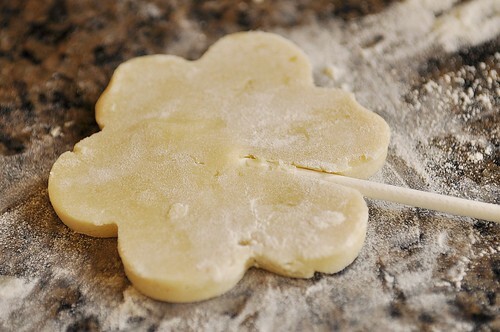 Check out my directions for how to frost a sugar cookie too. The next step in assembling your cookie bouquet is to pick out some filler. This is the stuff that you will put in and around the cookies. My favorite place to get filler is the Dollar Store. 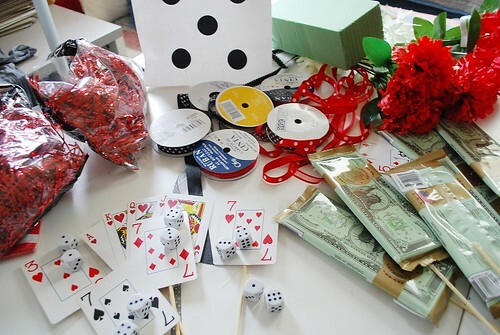 For the Guys and Dolls bouquet I bought some playing cards, dice, red carnations and some chocolate candy bars that looked like dollar bills. If you aren’t familiar with the storyline of Guys & Dolls there is a lot of gambling, dice throwing and red carnation wearing going on. 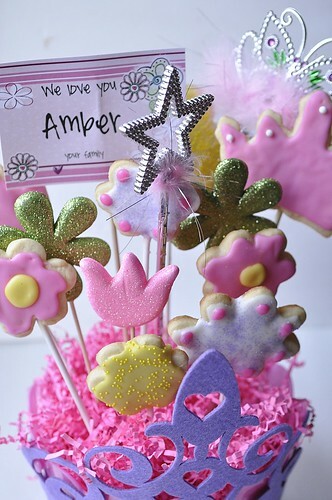 For the Hairspray bouquet I found some fun glitter flowers on sticks and a fairy princess crown and wand that I used. Tessa played Amber and it’s all about the crown for Amber! For the Hairspray container I bought a pink plastic Easter basket (from the Dollar store), and removed the handle. I also found a fun felt cut out of a crown (guess where it was from!) that I glued around the basket. Fill your container with some green florist foam (Dollar Store) and then cover it with some shredded paper filler (Dollar Store) Love that Dollar Store! I insert the cookie sticks first and then fill in around them with everything else. I cut the sticks to different heights so there is some variation. A fun little sign or card was the finishing touch. It is such a fun project and the possibilities are endless. A cookie bouquet would make a fun graduation gift, birthday gift and or a gift to mark any special occasion or accomplishment. What ideas can you come up with??!? This post has been updated and was originally share in 2011. I LOVE this idea! Now I just need a good reason to make a cute cookie bouquet. Hmmm, may April Fools or Easter or Mother’s Day. Leigh Anne you never cease to amaze me! Fantastic. I’m a sucker for a good frosted sugar cookie too. You are amazing Leigh Anne. I’ll have to try this soon! Thanks for sharing your fun ideas. Your bouquets are beautiful. Thanks for showing us how to make them. I am really excited to make the cookies with the glaze frosting. I had them once and always wanted to make them. You are full of wonderful ideas! Thanks for sharing and linking up! I featured your post in my wrap up! 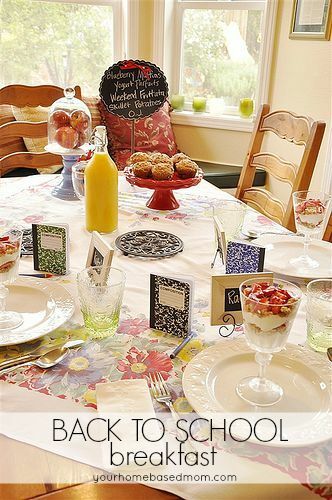 http://tidymom.net/2011/im-lovin-it-wrap-up-3-26-11/ Have a great rest of the weekend! These are just lovely and the tutorial is wonderful! Thanks so much for sharing. I have yet to try this but I will bookmark for sure. What a great tutorial. 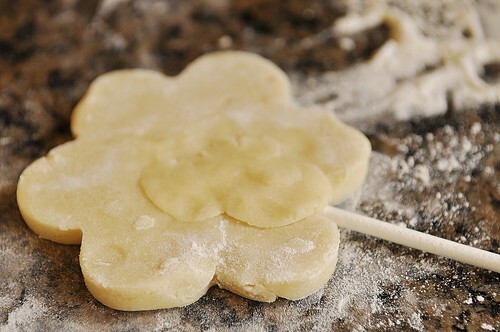 I am going to have to try to make a cookie bouquet sometime so thanks for sharing your tips on how to do it. Brilliant creations! You have given me some inspiration for attempting to create my own beautiful bouquets. Thanks! 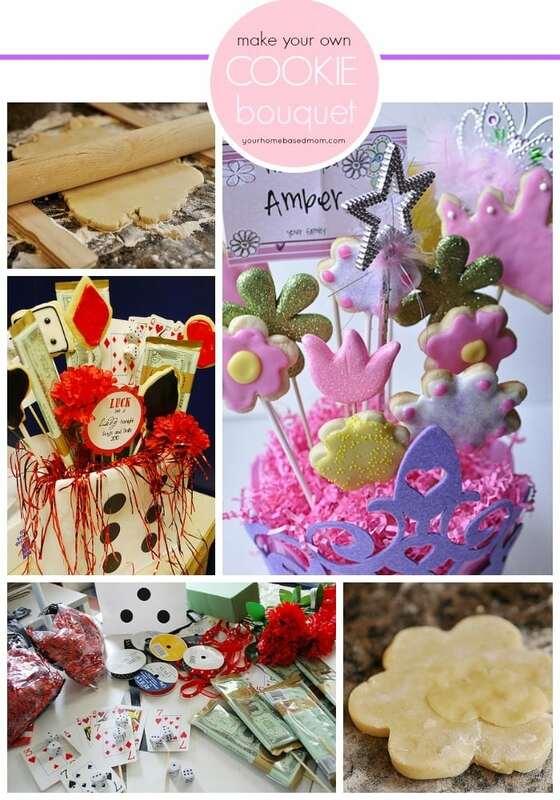 Your cookie bouquets are amazing! I love the way you carried out the themes. Thanks for sharing. This project is next on my list! Thanks for the adorable ideas! THanks so much for sharing this. My daughter made a Father’s Day bouquet. It tastes great, and she had so much fun! Love the idea of a Father’s Day bouquet. I’d love to see a photo of it. What shape cookies did she use? Hi Leigh Anne! 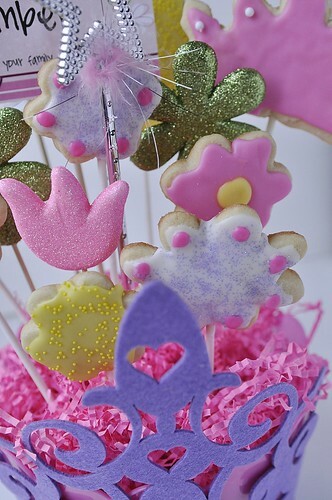 Your cookie bouquets are beautiful! I am considering making one for my husband for Valentine’s Day this year! My question is…in your pictures of the hairspray bouquets, you decorated some of the flowers with what looks like GREEN GLITTER, and I LOVE LOVE LOVE it! They are so sparkly and they make me very happy! 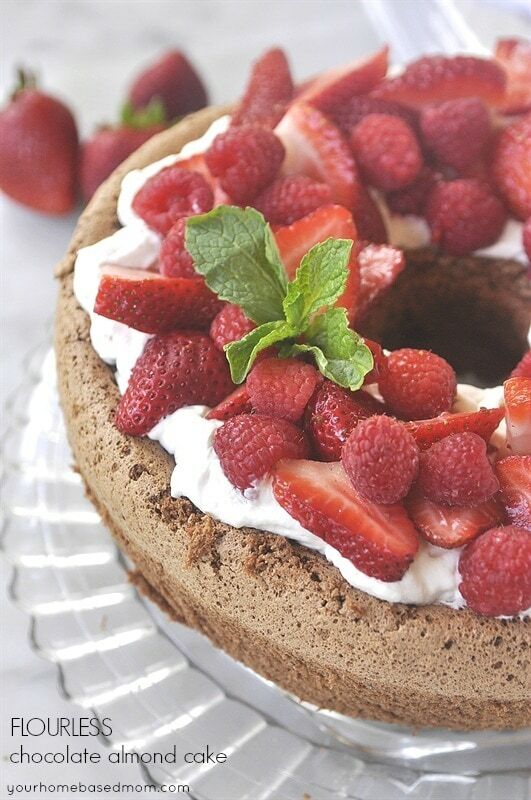 Can you tell me what icing product that is, or if you made it…do you have a recipe? Those are actually plastic flowers I found at the Dollar Store! Have fun with it! Thanks a lot for making such a good tutorial and for sharing your knowledge and experience!!! Where is your Sugar Cookie recipe? Hi! I was wondering if you mailed those out to people and if so, could you tell us how you packaged them so they wouldn’t break? I love the Dollar stores!! Thank you for your instructions on how to make the bouquets. I have never mailed one before but it you pack it carefully with lots of peanuts and padding it should work. Just wondering how easy it is to insert the stick without cracking the dough. Is there a special bakers tidbit you can give me. Also, once stick is in dough do you use a spatula to scoop up and put on pan? Janie, If your dough is the right thickness it will work, Just push it in slowly. If you find that it cracks a bit, get your finger damp and glue the dough back together again. Sometimes I have also put a little bandage of dough on the back. You can use a spatula to gently lift them onto pan or just put it directly on the pan as soon as you have the stick inserted. Hope this helps. I can’t find your recipes. I’d sure ke to try the cookies and frostings. Lee, There are links to all the recipes within the post. Enjoy! These are adorable! So there is no problem the stick burning while baking the cookies?